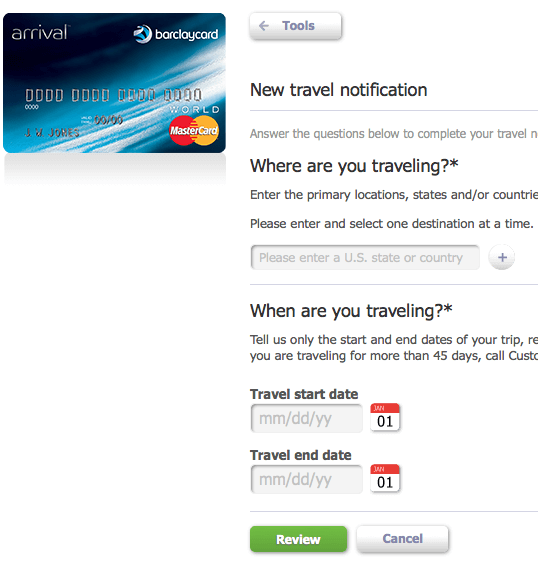 Set Travel Notifications for Your Credit Cards Before You Leave! If you’re taking a vacation soon, don’t forget to set travel notifications on all the credit cards and debit cards you plan on taking with you before you leave. These notifications inform your card issuers that you will be traveling in specific locations on specific dates so your charges will be approved. Otherwise they may think the charges are fraudulent, leading to declined purchases and lots of frustration while a long way from home. Fortunately, it’s very easy to set up these notifications online without speaking to a single person (my preferred method). Let’s go through the major card issuers one by one so you know where and how to complete such a notification. So you don’t need to do anything with your Amex cards – just keep in mind that many Amex cards charge foreign transaction fees, meaning they may not actually be the best credit cards to take abroad. 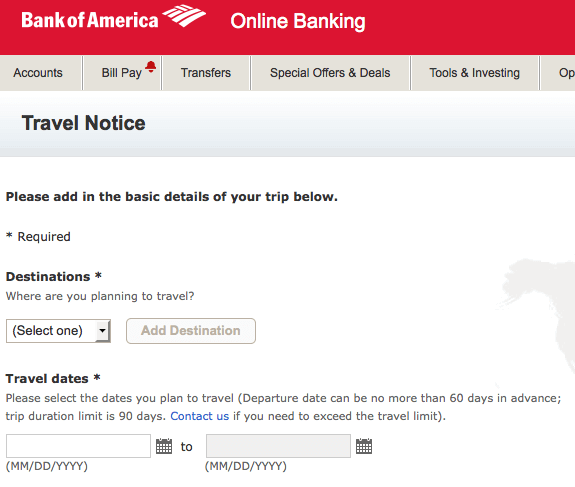 If you log in to your account via this link, it will take you straight to the travel notifications area of their website. 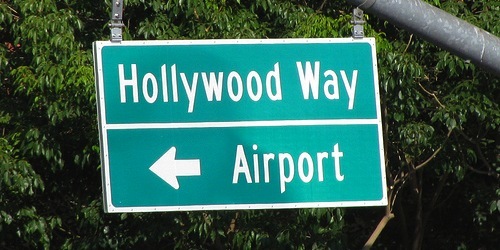 There you can set up the travel notifications necessary for your trip. They can be made 60 days in advance but cannot exceed 90 days in duration. You’ll be able to select all the accounts you’d like to turn notifications on for, which is certainly a time saver. Once logged in, click on “tools” at the top of the site and then click on “My Travel.” From there you’ll need to fill in the travel destination and dates. Alternatively, you can call customer service at 1-866-383-5310 if you prefer. Once logged in at the Chase website, navigate to “manage accounts” from the right-hand menu, then you’ll see “Travel Notification Form” under all your different account types. You need to repeat the process for personal credit cards like Freedom, and for any debit cards you may have. Annoyingly, business credit cards such as Ink need to be handled via the secure message center or via phone by calling 1-800-346-5538. You can also call them collect at 1-302-594-8200 from outside the country. If you have a Citi card, such as the Citi Premier or Citi Prestige, there’s a dedicated page to set up travel notifications to avoid any disruptions while abroad. Citi allows three active travel notifications per account and up to five destinations per notification. So if you’re visiting a ton of countries you may need to break it up into several notifications. Discover also has a dedicated page to set up travel notifications. Once you input the dates and locations, it will also tell you what the acceptance is like for each country. This is helpful because Discover isn’t as big as Visa/MasterCard/Amex, and thus isn’t always an acceptable form of payment. 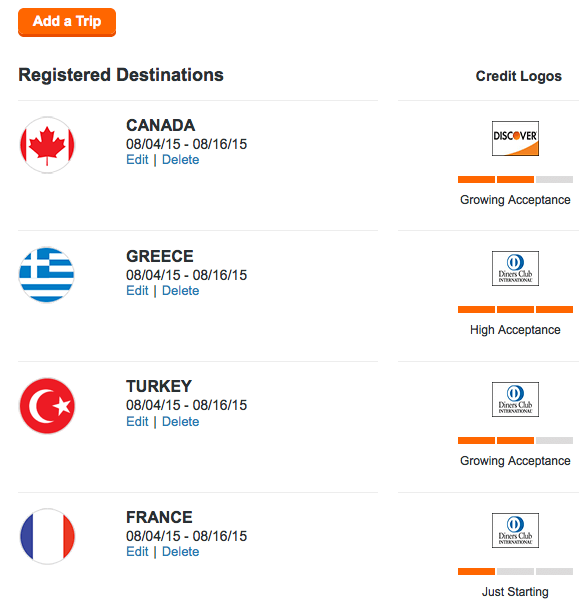 As you can see, Diners Club works for Discover and it’s highly available in Greece of all places. However, it may not work in Canada or Turkey, and most likely won’t be accepted in France. Lastly, if you have bank accounts tied to a debit card you’d like to use, be sure to tell them about your travel plans as well. Obviously pulling cash out of ATMs is very important, so don’t overlook any accounts. Also keep in mind that even if you don’t plan on using a certain account, you may wind up using it unexpectedly, so add notifications for that card as well!